Lock in a great price for Ao Prao Resort – rated 9 by recent guests! Total comfort from the moment you reach the pier to take shuttle boat, till you reach your room. View is breathtaking, infinity pool is great and beach is wonderful. Breakfast buffet is very good. Staff is very helpful. The location was great very peaceful and beautiful. The front desk was very helpful and friendly. Compared to other hotels on the island, it has a massive selection of both western, thai and asian food. The resort is beautiful, very clean, super friendly staff, great breakfast with thai and western options. Situated on a beautiful beach strip. There are 3 (or 4, couldnt really tell) other resorts on the same strip. The resorts are interlinked with a small boulevard which is really nice and you can walk over to have drinks and food at another resort if you want to. Also there is a taxi service to go around the island. the accommodation is really awesome. So clean and prefectly beautiful than i expected from online pictures. The room was large and well fitted out. The staff were helpful. Beautiful peaceful location. Great & easy transfer from the mainland & back. The beach is stunning, clear warm sea & plenty of sun beds on beach. Getting a taxi to the town was fairly easy & cheap. Mopeds for rent at the edge of the resort. Large comfortable room and all staff and service was fabulous! Paired with the most beatiful island landscape and surroundings puts Ao Prao at the top of our must return to places. 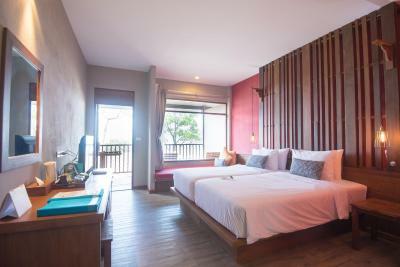 Ao Prao Resort This rating is a reflection of how the property compares to the industry standard when it comes to price, facilities and services available. It's based on a self-evaluation by the property. Use this rating to help choose your stay! 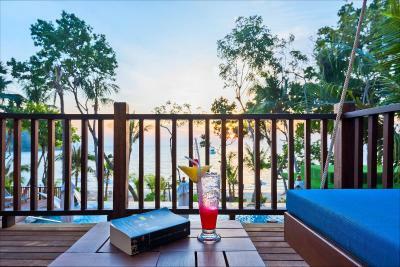 One of our top picks in Ko Samed – and a guest favorite. Guests of Ao Prao Resort can take a dip in the outdoor pool or engage in water sports such as canoeing or snorkeling. Hiking and biking trails are also available. The resort provides a free shuttle service from Koh Samet to Ao Prao Pier. Fitted with wooden flooring, air-conditioned rooms at Ao Prao Resort feature contemporary Thai décor. In addition to tea/coffee making facilities and a mini-bar, a TV with satellite channels and a DVD player are included. Private bathrooms come with a hairdryer. Open until midnight, the resort’s restaurant serves authentic Thai delights and international dishes, accompanied with panoramic views of the sea. In-room dining is possible. A wine cellar and a bar are also available. Located on the west coast of Koh Samet Island, Ao Prao Resort is an hour’s drive from Pattaya City and a 2.5-hour drive from Bangkok City. 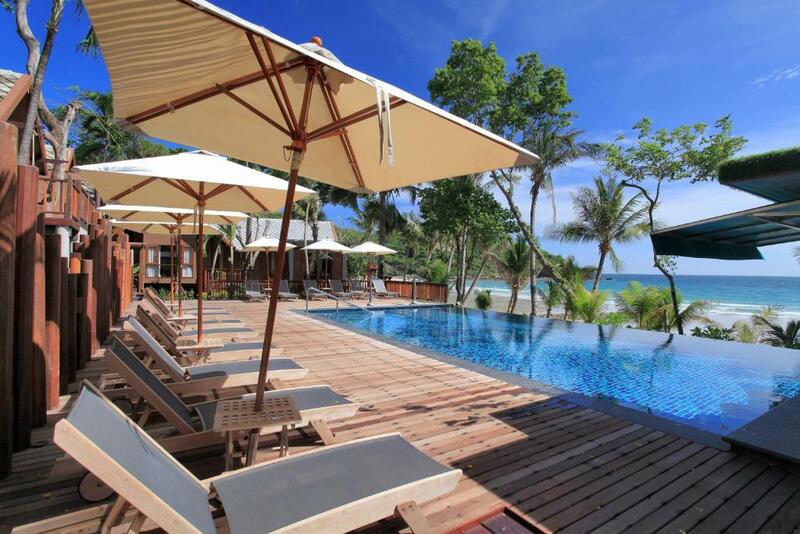 This property also has one of the top-rated locations in Ko Samed! Guests are happier about it compared to other properties in the area. This property is also rated for the best value in Ko Samed! Guests are getting more for their money when compared to other properties in this city. When would you like to stay at Ao Prao Resort? Located on the hillside, room features an air conditioning, a working desk and a seating area. Private bathroom comes with free toiletries and shower facilities. There is a private balcony in this room. Due to the location of this room type, it may not be suitable for family with young children or senior citizens. This cottage has a balcony, bathrobe and seating area. This double room has a balcony, sea view and bathrobe. Discover an exclusive Boutique Resort on Koh Samet’s most serene palm fringed beach. Nestled on a gently curving bay bordered by picturesque rocks and jungle outcrops, Ao Prao Resort offers endless relaxation along the white sand shores with warm turquoise waters for an idyllic, paradise getaway. A distinctly Thai village ambiance awaits as you find tranquility and privacy amongst the gently swaying palms overlooking the glorious Gulf of Thailand. The traditional Thai style cottages and rooms blend effortlessly with the natural surroundings, so you can truly take a break from reality and leave your worries behind. A combination of warm friendly service, fine dining experiences and exemplary leisure facilities ensure an unforgettable and relaxing holiday experience. Ao Prao Resort offers beachside serenity for couples and families seeking a dream Thailand beach escape. House Rules Ao Prao Resort takes special requests – add in the next step! Ao Prao Resort accepts these cards and reserves the right to temporarily hold an amount prior to arrival. Credit card provided during the booking process will be used for guarantee purposes only. A prepayment deposit via payment gateway or bank transfer is required to secure your reservation. The property will contact you after you book to provide further instructions. Please note that room rates include a round trip shuttle boat transfer between Ao Prao Pier (the hotel's pier in mainland), and Ko Samet. Please note that from 1 November 2017 onwards, guests are required to pay for the admission fee to Khao Laem Ya Mu Ko Samet National Park by themselves at the resort reception desk. Guests are kindly advised to contact the property directly for more information. Contact details can be found on the booking confirmation. Guests are advised to look out for Ao Prao Pier when arriving at the pier on the mainland. Kindly be at Ao Prao Pier 30 minutes before departure time. Guests who are unable to accommodate the boat shuttle schedule will have to hire a private speed boat at THB 2000 per boat per trip. The shuttle boat service will bring guests to Ao Klang Pier (Ko Samet) and then all guests will join a ground transfer (local taxi) from Ao Klang Pier to the resort. Guests are required to show a photo identification and the credit card used during booking upon check-in. Please note that the name of the credit card holder must be the same as the guest's name. Please also be informed that the property will strictly not allow guests to check in if the holder's name of the credit card used during booking is different from the guest's name. In case that the guest does not bring his/her own credit card used during booking, the guest will be required to pay the full amount again at the front desk. The total amount which was previously deducted from the credit card used during booking will be refunded to the same card within 30-45 days. More cooked vegetarian options for breakfast. Wider range of cereals at breakfast. Plenty of loungers and parasols on the beach. Peaceful atmosphere. Helpful staff. At the departure, a little misunderstanding regarding the bill. But it was fixed very quickly and the staff understood that the mistake was on their side. So even this small hic-up is not a bad experience. The hotel is a real luxuary hotel for Koh Samet. If you rent a bungalow with see view you will get the best experience. The staff is very nice and dedicated to your confort. The restaurant is very good and offers qualitative thai food. Real holidays, good times spent there. The food in the restaurants is too expensive compared to its mediocre quality. Quite many small children instead of calm romantic couples which I had expected. Elegant, laid back and tasteful resort. Beautiful bay with crystal clear waters. Except for one grumpy female receptionist extremely friendly staff. Perfect stay to relax for a few days. -premier seaview rooms (301-309) face the sea, but across the ROAD, so, we had a view of the CARS parked near the reception (from room 301). Not the worse, though, as other rooms of this type face the Pool! (rooms 305-308)! meaning crowds of shouting children and no privacy (I am a parent myself, no offense). I would rather move to Beachfront cottages (rooms 108-111), as they are directly on the beach (no road). and for some reason, cheaper!! But they were fully booked (of course!) - breakfast has little choice for vegetarians - eggs, cheese, yoghurt, bread, fresh fruits and vegetables, that's it. And if you do not eat eggs and dairy, then you will go with raw fruit and vegetables. All the cooked meals had chicken, meat, sausages in it. - sadly, garbage arrives from the sea all the time... Although the stuff and the tourists make a lot of effort to clean up - unexplainably, there is no tent over the outside sitting area of the room! That means that during the day it is too hot, and if it rains, your drying beach clothes get wet again... What is the point of a veranda withour a sunshade? -friendly stuff, smiling and helping with everything -easy to get to - you arrive to Ao Prao Pier and then it all happens by itself, the luggage, the boat (10 mins), no worries at all - the beach is not at all crowded, even on weekends, no noisy tourists or speedboats - live coral in the far south end of the beach (10 mins walk from Ao Prao in the direction of Le Vimarn). We saw lots of fish, seastars, seabass, colored clams (Tridacnas), sea urchins (careful! ), etc. - nice fireshow, our 5 years old loved! Only first class hotel that I have been charged for ice. Made up for by free 4 course meal on the last night. Great location, and everything so easy after arriving at their private pier on the mainland. From mainland to island less than 10 minutes in speedboat. Check in done on mainland, so straight to room. Superb servive. Some of the staff need some more training in English. It was a bit hard for them to understand what we needed. Although they were always eager to help.